When Major Charles Rane (William Devane) returns home to San Antonio, Texas, he is given a true hero's welcome. He and his friend, John Vohden (Tommy Lee Jones) have endured 8 years of physical and mental torture in a POW camp. The adjustment isn't going to be easy. His wife has fallen in love with another man, and his son, whom he adores, no longer remembers him. In Rane's own mind, he is a walking dead man – he died the day he was taken prisoner. However, what Rane doesn't know is that his experiences as a POW are nothing compared to the ordeal he is about to face. The unthinkable happens and Rane, subdued and more distant than when he returned, is forced to plan out his own justice, with the help of his friend Vohden. But there is no sense of pleasure in his task; only the ice cold determination of a man who has suffered too much and refuses to be stopped. A choice cult revenge thriller from 1977, and when we say cult we mean it – Quentin Tarantino even named his short-lived DVD distribution company after this film. Directed by John Flynn, also responsible for the brilliant 1973 crime thriller The Outfit and the hugely enjoyable 1987 Best Seller, the script was based on a story by Paul Schrader and released just a year before Schrader moved from providing scripts for films such as Taxi Driver and Obsession to directing his first feature, the excellent Blue Collar. 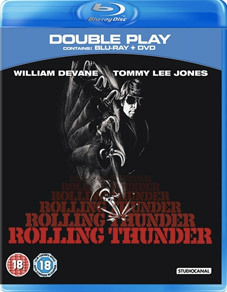 Rolling Thunder will be released on UK double-play – containing both Blu-ray and DVD versions of the film – by Studiocanal on 30th January at the RRP of £22.99.